omeland competition from the Barnes & Noble Nook. The free Kindle for iPhone app [iTunes link] lets you read books you purchased on the Kindle straight onto your mobile phone, and you can also synchronize bookmarks between the devices using Amazon's Whispersync technology. The iPhone app is part of Amazon's cross-platform strategy, making your Kindle purchases available also on your PC (and soon on Macs and BlackBerry phones). Amazon started selling the Kindle outside the U.S. earlier this year, and the expanded international availability of the iPhone app is seen as the company's strategy to reach more users on multiple platforms. 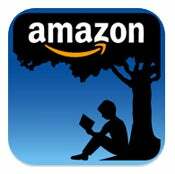 Additional features of the Kindle for iPhone app include the capability to purchase books from the Kindle Store and also read the beginning of a book for free before purchase. Barnes & Noble, whose Nook ebook reader was launched last week, is the main competitor of the Kindle. The Nook features an additional color touchscreen next to the e-ink display designed for reading the text, but the Barnes & Noble reader didn't receive a warm welcome from many reviewers due to buggy software. Barnes & Noble also offers a free iPhone and iPod touch app to access their bookstore, alongside PC, Mac. and BlackBerry counterparts. Amazon refuses to divulge sales numbers of the Kindle, but the company said that it hit a sales record in November, topping all previous months in the two-year history of the device. 2010 is set to be a tougher year for the Kindle, as besides the Nook, the device will see new competitors from Plastic Logic, Asus and possibly Apple.